Last year I spent Christmas in Perth, Australia. On Christmas Eve I went to a church near the beach for Evening Mass. It was really big and new looking and I remember thinking that there were a surprising number of Asians there. As I sat at the back pews (my usual practice everywhere), I realised that most of the congregation were Filipinos. How do I know this? Because some of the hymns were in Tagalog. Not being able to speak, what more sing in, Tagalog, I would look around the room and hum sheepishly during the Tagalog singalong. But the best was yet to come. Feeling as if I was trapped in a surreal Fellini moment, I blinked incredulously as I recognised the hymn that started up next. It was Lamb of God. Not unusual. Except that it was sung to the tune of Edelweiss. It was a terrible struggle to hide my shaking shoulders as I gasp and choked on my suppressed laughter. I kept seeing this vision in my fertile little mind ... a little sheep with edelweiss twined into its fleece, skipping along merrily in a field of edelweiss. I was turning purple and I could not get out of the room since I was sandwiched right in the middle of the pew. It was hell. I never forget Christmas Mass in Perth because of that. And I can never listen to Lamb of God anymore without cracking up. I so know I am going to the fiery pits of Hell. Anyway, back on earth such as it is ... As if I was not all muttoned out with my Mutton Curry, I had Hainanese Herbal Mutton Soup for dinner last night. This is a dish that also has vast amount of memories for me. My grandfather used to make these incredibly delectable pots of Hainanese Herbal Mutton Soup that everyone will wolf down as if we had not eaten in a thousand years. Even those who did not enjoy lamb would devour every morsel and slurp every spoonful of this flavourful soup. Knowing it was my favourite dish, he would cook it for me on quite a regular basis and reserve the biggest portion for me. That, of course, did not endear me to my aunts who always felt that I was his favourite. It also did not help that I would make rude, orgasmic noises when I ate my super-large portion of Hainanese Herbal Mutton Soup. It is one of my greatest regrets in life that I never learnt how to make my grandfather's mutton soup. All I knew was that he learnt it from fellow Hainanese Chinese doctor. He never allowed anyone in the kitchen (in true family tradition) when he cooked it. I can only remember that it had beancurd skin, wolfberries, dang gui, and a lot of other Chinese herbs. I wish I had his recipe. In fact, no one in the family has the recipe and we have all tried to recreate this ambrosia for the gods for decades after his death. So, every time I am in a hawker place that has Hainanese Herbal Mutton Soup, I have to try it just in case it is in any way similar to my grandfather's. So far, none have come close. I was at the Albert Complex hawker centre yesterday evening and I saw this stall. 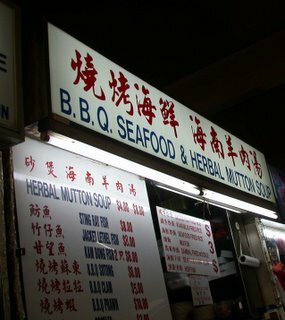 I was fairly skeptical as the signboard said Hainanese Herbal Mutton Soup and BBQ seafood. Eh? That is an odd combination. Still, I had to try it. My first sign that all is not well was when I tried to speak Hainanese with the stall keeper. My grandfather taught me this as a child and while I am very rusty and not very fluent, I can still hold a rudimentary conversation in it. The stall keeper could not speak Hainanese and was in fact, Hokkien. Bad sign No. 1. It was a long wait for the soup and when it came, it was barely simmering in a claypot. By looking at the colour of the broth, I knew immediately that I would be disappointed. It was way too clear, which tells me that the soup has not been simmered long enough. As I dug my chopsticks into the soup, I could see that it was mostly black fungus and beancurd skin. Worse, these two had not been soaked and cooked long enough such that they were still fairly al dente instead of meltingly soft and soaked with the combined flavours of all the herbs. The black fungus was also of an inferior grade, being thick and rubbery. I tried the broth and it was bland. She had not put in enough and of the right combination of Chinese herbs. She had also added way too much ginger in order to disguise the taste of the mutton. Why do people do that? If I did not want the taste of mutton, I would have ordered chicken soup! It also told me that she did not use the freshest of mutton if she had to do that. I was supremely disappointed and faintly disgusted. I think it is very very wrong to call yourself a Hainanese whatever when you are not. If you want to emulate the food of a particular ethnic group, at least get it right and do not insult that race or nationality. Even if in all ignorance you mess up the recipe, at least try to offer something in compensation. The freshest ingredients perhaps? A sincere desire to offer the best service as well? Surly service, poor quality of ingredient, total disregard of the authenticity of a recipe and totally false advertisement made me rate this "Hainanese" Herbal Mutton Soup a 2 out of 10 in my books. Your article reminds me that I better learn to cook authentic Hainanese Herbal Mutton Soup from my parents while they are still alive. Being a Hainanese myself, this has always been my favourite dish. Thanks MM. This is a very well written article. 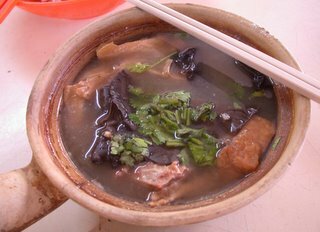 Hainanese Herbal Mutton soup? that's what my dad used to cook. sad to say, we din learn that from him before he passed away. My mom managed to learn from my dad but the taste still not exactly the same.